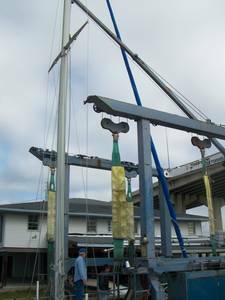 TURNER MARINE has been rigging and de-rigging masts for over 60 years. The Turner's are a family of sailors and that passion is what started the first Turner Marine in Montgomery, Alabama. We can step or de-step masts up to 70' above mean high water. We have extensive experience in overhauling old rigging or installing new masts, electrical, conduit, etc. We are PROUD to say we have been the Americas Great Loop Cruisers Association Members choice for mast delivery, storage and stepping for the past 6 years. Each year, we step and de-step dozens of masts for vessels transiting the Tennessee Tombigbee Waterway. We can also pack masts for road transportation and load them on a truck.